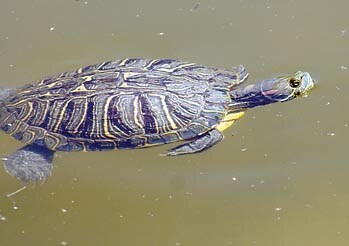 The first step in converting a pond to native species is to eliminate the non-natives. The most drastic but effective measure is to consider drying the pond. May and June are our driest months and the best time to dry a pond. If any of the species in your pond are mobile, like bullfrogs, turtles and crayfish, you will need to set up a perimeter fence to contain them and make arrangements for their removal. Contact the Arizona Game and Fish Department, Invasive Species Coordinator at (623) 236-7600 or the University of Arizona, Department of Ecology and Evolutionary Biology (520) 621-3187 for help in placing these animals where they will not do any more harm. As the plants are drying, remove them and haul them off to the county landfill. Aquatic snails can be beneficial to the native pond by consuming algae. Snails will hitchhike on the plants you acquire and are almost unavoidable. There are invasive species of snail like the New Zealand mud snail that are very difficult to tell apart from native snails and very little information on other common snail species. There are a number of introduced species of fresh water clams that are of major concern over their impacts on wildlife so it’s best to avoid all clams and avoid distributing your snails unless you are positive they are native. Drying the pond is the only practical way to remove either mollusk. If the pond is not too large, bullfrogs can easily be removed, but their tadpoles present a challenge. The frogs will attract to a spotlight if the light is left on for several consecutive nights. Set up the light at the edge of the pond, aimed at the water, along an open shoreline where you can easily approach from behind the light. The blinding light will hinder the frogs ability to see you and you should be able to get close enough to net them. Some will get away and become wise to your technique so leave the light on for a few nights before you try again. Some pond owners in rural areas prefer to use a BB gun for bullfrog removal. BB’s are nontoxic and unlikely to puncture a pond liner but injuring or killing the frogs is not for the faint at heart. If a captured bullfrog needs to be destroyed, the most humane way is to bag it and throw it into your freezer overnight. Crayfish sometimes called crawdad or fresh water lobster are extreamly harmful to wilderness wetlands. 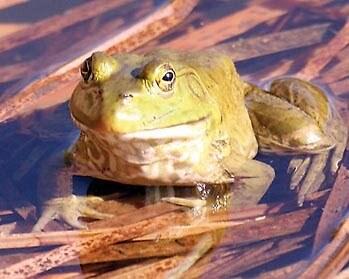 The american bullfrog, native to eastern U.S., eates anything it can get into it’s large mouth. Recent studies have implicated these frogs in spreading a deadly disease to native leopard frogs. Bullfrog tadpole shown in lower photo. Bullfrog egg masses vary in size from 6 inches across to the size of a dinner plate and can contain as many as 20,000 eggs in one mass. 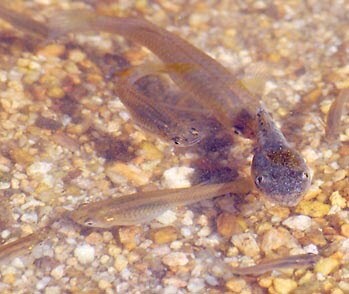 The tiny mosquito fish has been introduced worldwide displacing native species. This picture shows a group attacking a native leopard frog tadpole. Avoid this fish!